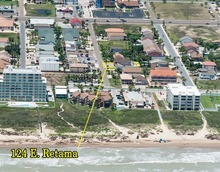 Permit # 2015-383472NEWLY RENOVATED UPPER LEVEL, PRIVATE HEATED POOL, FIRE PIT AND MORE!Pictures taken in November 2016!Looking for a home on South Padre Island that can accommodate up to 20 guests?Boasting 7 bedrooms and 6.5 bathrooms, This is the perfect property for a large group or family reunion! This family friendly vacation rental is split into two separate fully functioning accommodations, with full kitchens! One group can rent the entire home and have two separate units for privacy when needed! The property is split into an upstairs unit and downstairs unit. Access to the upstairs accommodation is right up the staircase in the garage/game room. The staircase opens up to an enclosed sunroom upstairs. The NEWLY REMODELED upstairs entails a large open concept kitchen, dining and living area. The kitchen is fully stocked with pots and pans to meet any guests cooking needs. The bedrooms feature two (2) master suites, each with attached bathrooms & walk-in closets, plus two (2) additional bedrooms and a bathroom.The downstairs accommodation features another fully stocked kitchen, living area, and dining area. There are two bedrooms in the downstairs accommodation, the two (2) master suites, each with attached bathrooms & walk-in closets. In addition to those six (6) bedrooms throughout the house , there is an additional bedroom with a private entrance located by the pool area. This bedroom also has an attached bathroom. Whether you are trying to beat the summer heat or enjoy a warm swim in the winter the private heated pool is always a great place to unwind! The BBQ area is great for family cookouts and when your done cooking you can sit down and relax next to your own private fire pit! The driveway is very accommodating and can hold up to five (5) vehicles.